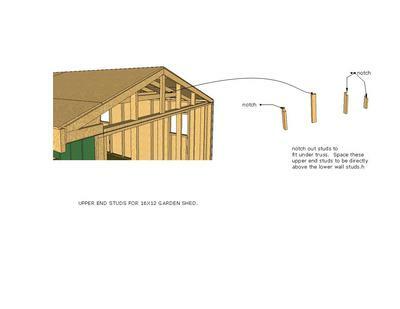 Would you please describe the best way to do the upper end wall framing on the 16 x 12 Saltbox Shed. I don't see this described in the plans, nor can I find it here. It appears that the studs here will need to be notched to fit around the collar tie. Thank you for buying a set of my plans. I have attached a picture of what the upper end studs need to look like. Hope this help you out.